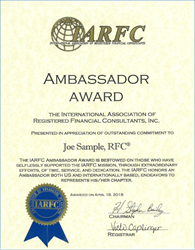 The International Association of Registered Financial Consultants (IARFC) announces that Barry Dayley, MRFC, Executive Vice President of Money Concepts International has been given the Ambassador Award for 2019. The Ambassador Award will be given at the IARFC Annual Conference in Nashville, TN during the awards banquet on Thursday March 21. “Barry is a true leader and influencer. We are fortunate to have him as part of our network of professionals who go out in the financial community and support our vision.” ...IARFC hairman & CEO H. Stephen Bailey, MRFC.